President Trump has proposed a number of tax reforms that would significantly change the taxation of both personal and business income. In particular, the proposals would broaden the income base and create significant nominal rate reductions on the income of businesses and high-income individuals. The following appear to be the key elements of the Trump administration’s tax proposals. We note that the House Republicans have a competing tax plan and it is unlikely that all of these proposals will be enacted in their present form or perhaps at all. The maximum corporate income tax rate would be reduced from 35% to 15% and the corporate alternative minimum tax would be eliminated. It is not clear, but there is some indication that this 15% rate is also intended to apply to business income generated by pass-through entities, such as S corporations, limited liability companies and partnerships. A one-time deemed repatriation tax of 10% would be levied on cash held by foreign subsidiaries of U.S. corporations. Going forward, the income of such foreign subsidiaries would be subject to U.S. income taxation on a current basis. Most special corporate tax preference items, such credits and deductions that are intended to promote public policy goals rather than to clearly reflect income, would be eliminated. The research and development tax credit would be spared, however. Manufacturers could elect to forego their interest expense deduction in exchange for immediate deduction of capital expenditures. Personal exemptions would be eliminated altogether, while the standard deduction would be increased to $15,000 for single filers and $30,000 for joint filers, and income up to these levels would be untaxed. Itemized deductions would be capped at $200,000 for joint filers and $100,000 for single filers. 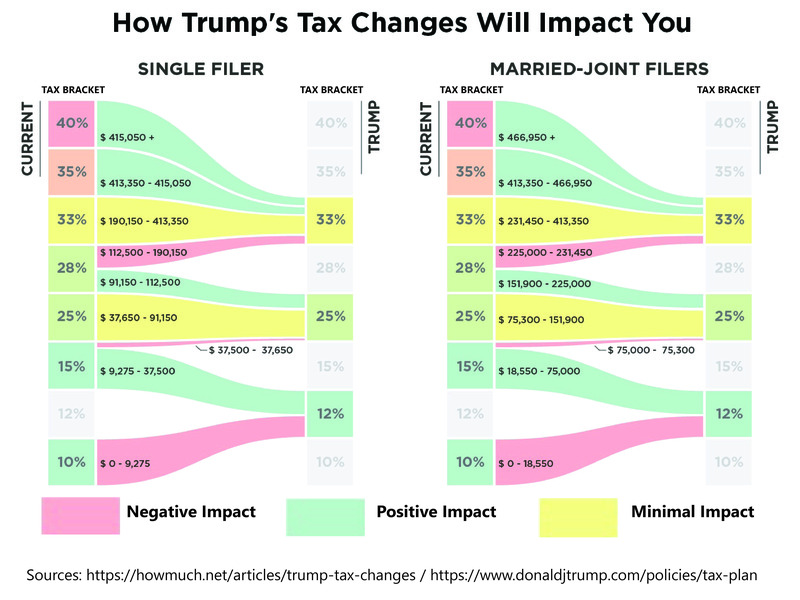 Individual income tax rates would be consolidated into three brackets: For joint filers, a 12% rate would apply to income under $75,000; income between $75,000 and $225,000 would be taxed at 25%; and a 33% rate would apply to income in excess of $225,000. Currently the highest individual rate is 39.6%. The bracket amounts for single filers would be half of the amounts above. The individual alternative minimum tax would be eliminated. 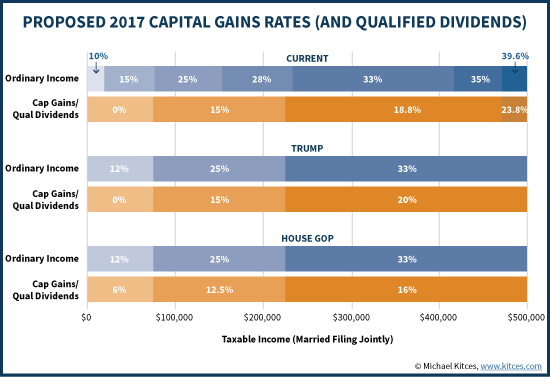 So-called “carried interest” would be taxed solely as ordinary income, eliminating the potential for capital gains treatment. The maximum rate on long-term capital gains would remain at 20%. The “qualified dividend income” regime would remain in place, thereby subjecting qualified dividend income to a maximum rate of 20%. The gift, estate and generation skipping transfer taxes would all be repealed. In their place, unrealized capital gains in excess of $10 million at the time of death would be subject to income taxation. In the case of a married couple, it is unclear whether the tax would be imposed upon the first spouse to die or would be deferred until the death of the survivor. Currently, the law allows such unrealized gains to escape income taxation by providing for a “stepped-up,” fair market value basis upon death. The 3.8% Net Investment Income Tax, which was enacted as part of the Affordable Care Act, would be repealed. The Trump plan is believed to produce a significant reduction in annual tax revenue. There is no indication as to whether, how, and to what extent lost revenue will be replaced. However, the Republican platform generally supports a balanced federal budget. For more information, please contact one of the authors of this alert, Barry E. Fink, Partner and Chair of the Tax and Trusts & Estates Departments, at 310.282.6229 or bfink@glaserweil.com, or Michael J. Chambliss, Associate, at 310.282.6295 or mchambliss@glaserweil.com, or your Glaser Weil relationship attorney. Barry Fink manages an exceptionally active and dynamic practice with a significant emphasis in negotiating and structuring international business transactions, particularly those involving multinational corporations.